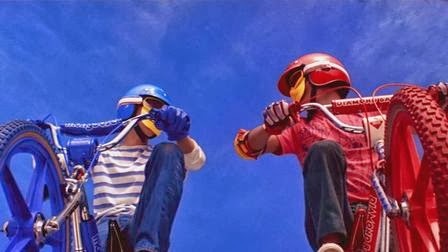 This movie has everything you could possibly want - that is, if your list of heart's desires only includes BMX bikes, Australia and Nicole Kidman. And if that was your list, this might possibly explain why you didn't enjoy Moulin Rouge. Because something very important was missing. I'll let you figure out what it was. The plot synopsis - three teens, one of which being a rosy cheeked Nicole, thwart a bank robbery using their bikes. Also, there's walkie talkies - a box full of walkie talkies. And they're AMAZING. Like, if you lose your walkie talkie, there's just no getting it back. And if you do find out who stole it, then you just committed yourself to a thirty minute BMX chase across suburban Australia. Quentin Tarantino called this Australia's Goonies. According to the DVD box anyway. Its common knowledge that in order to gain acceptance as a legitimate sport, you need a movie about it. Karate has the Karate Kid, archery has The Hunger Games. 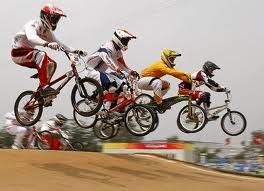 BMX has this. I can't wait to see what exciting story curling has up its stony sleeves. What those movies realized is that in order to have a tense and exciting heist scene, there needs to be some dignity to it. 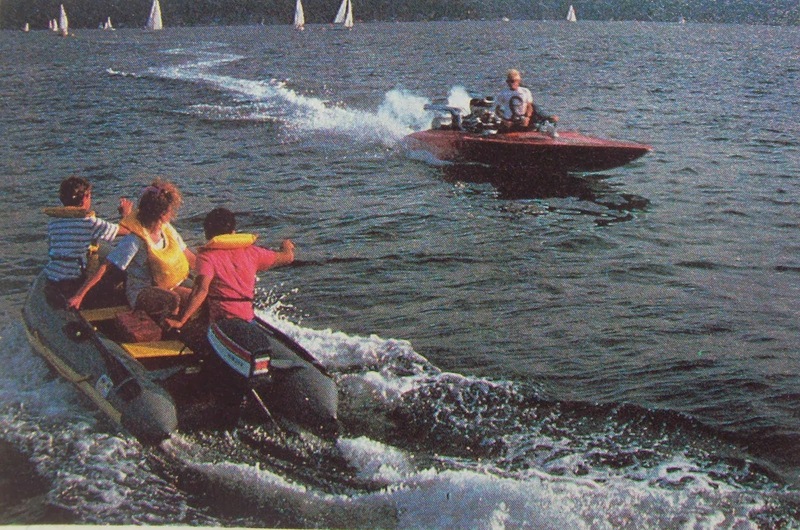 I've only added this still because that's probably the most awesome boat I've ever seen. If you ever doubted just how tall Nicole Kidman is, here's proof of how tiny she makes a grocery cart. Or grocery carts in Australia are just smaller than what we're used to. This movie's thing was these odd sorts of angles. Like what it might be like to see the movie from the bike or a earthworm's point of view. Frankly, I think this makes us all better people. The movie's plotline revolves around teenagers finding a box full of walkie talkies that belong to the bad guys. The bad guys will want these back and are prepared to give chase over them. I'm assuming there are no Radio Shacks in Australia. "Did I tell you I was in a little movie called BMX Bandits? Had a scene with Nicole Kidman where I showed her a carton of milk..."
Just my imagining the guy in the pink shirt's conversation with a date from Match.com. What I enjoy about the villain's briefcase is that while it's filled with your cliche'd stack of money, its also got his pens, business cards and documents so neatly organized. Does he have a day job as an insurance agent or was this a different age of the criminal mastermind? Whatever you do, don't lose the boss' walkie talkie. Because they're super hard to find. This kid has been destined to be the doughy comedic center to every film pastry. I'm sorry, kid. Life is going to be very cruel to you, but at least you made some people smile during a late night viewing of BMX Bandits. 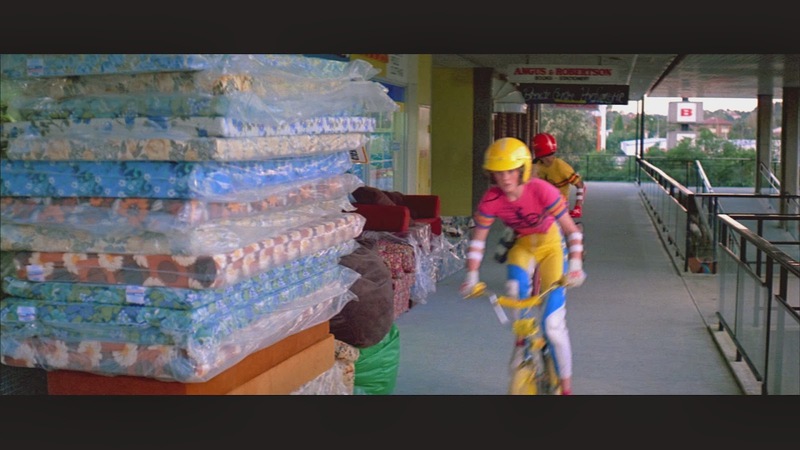 I'd just like to point out that at some point in the story, three teens walked into a custom tshirt printing shop and had matching BMX BANDITS shirts made. That'll make it harder for the bad guys to find you. Don't forget, there's walkie talkies involved. It's serious now. Also boats. Because you can't ride a bike on water? ...and cut straight to the part where they bike through a water slide. And this kid mugged his way down it. It ends with a guy getting a pie in the face. And they fight the bad guys by dumping flour and foam everywhere. They also took a break from the four notes that were being played with repetition with a cheap Casio, to insert some wacky ragtime cartoon music. 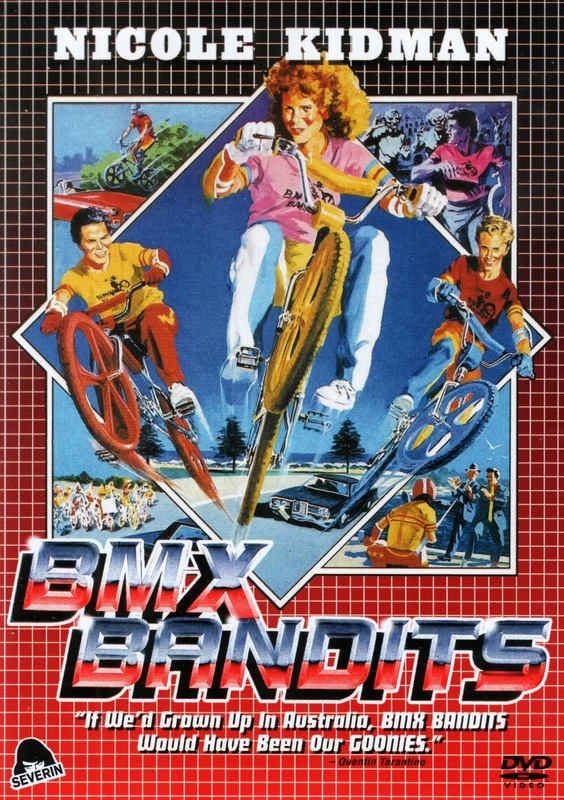 Needless to say, the bad guys learned some pretty good life lessons today, thanks to BMX bandits everywhere. But there's this helpful advice from the filmmakers. No word on whether or not walkie talkies are safe to use. I just want to know if it got better for this kid.